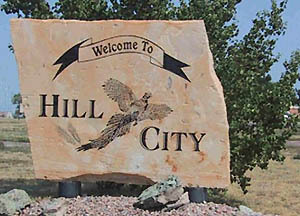 Located in central Graham County in Northwest Kansas, just north of the picturesque Solomon River Valley, Hill City offers a unique blend of shopping, dining, and great community living. Top-notch educational, commercial, medical and cultural facilities are available in this county seat community. An abundance of quail, ducks, pheasants, turkey, and deer in the county provide sport for the hunter. Take time to relax in one of several Hill City parks. Enjoy a dip in our modern swimming pool. Use the 9-hole grass greens golf course and tennis courts. A new softball-baseball complex and outstanding high school sport stadium complex are available for team competition. Visit the Oil Museum in Hill City, as well as, the community of Nicodemus, the Minium Fossil Quarry, Antelope Lake and the Cottonwood Ranch, all within easy driving distance form Hill City. We welcome you to worship in one of our 11 city churches. Good clean country living in an area wealthy in agricultural and mineral resources. GRAHAM COUNTY- 40,062 ACRES OF WALK-IN HUNTING!!! GRAHAM COUNTY HAS 40,062 ACRES OF WALK-IN HUNTING ACREAGE!!!!! The Oil Museum tells the story of oil from formations deep in the earth to it's recovery, processing and use. Many pieces of equipment used in the process over the years are on display. Nicodemus is the only remaining all African-American pioneer town west of the Mississippi. It was established in 1877 by ex-slaves from Kentucky and Tennesse. In 1976 it was designated as a National Historical Landmark and is currently under consideration for inclusion in the National Park system.